The Preschool Services Department is recruiting for a Home Visiting Initiative (HVI) Accountant II - Contract to perform a variety of professional accounting and auditing duties; prepare factual and analytical statements and reports; analyze and evaluate financial records and to perform a broad range of duties. The current vacancy is in San Bernardino, CA. Preschool Services Department (PSD) and the Transitional Assistance Department (TAD) are partnering together to provide a new home visiting program to eligible San Bernardino County residents. The program is funded by the California Work Opportunity and Responsibility to Kids (CalWORKs) Home Visiting Initiative (HVI) grant. The purpose of HVI is to support positive health, development, and well-being outcomes for parenting and pregnant women, families and infants born into poverty, expanding their future educational, economic, and financial capability opportunities, and improving the likelihood that they will exit poverty. This is an 18 month contract position, which may be extended depending on funding availability. Travel throughout the County will be required. A valid California Class C driver license and proof of automobile liability insurance will be required at the time of hire for the person providing the transportation. Must pass a pre-employment physical including a tuberculosis test and required immunizations (SB792). Must be able to lift small children and other objects weighing up to 50 lbs. Experience: One (1) year of professional-level accounting experience. Option 1: Bachelor's degree in Accounting OR Bachelor's degree in another field which includes 30 semester (45 quarter) units of completed college coursework in accounting or related field, half of which MUST be upper division. A list of completed college coursework or legible transcripts MUST be submitted with the application if the applicant does not possess a Bachelor's degree in Accounting. Applications will also be accepted from candidates currently enrolled in or having completed the last semester/quarter prior to graduating with a Bachelor's degree. A letter from the school indicating graduation date must be submitted with the application. Proof of degree conferred must be provided at time of hire. 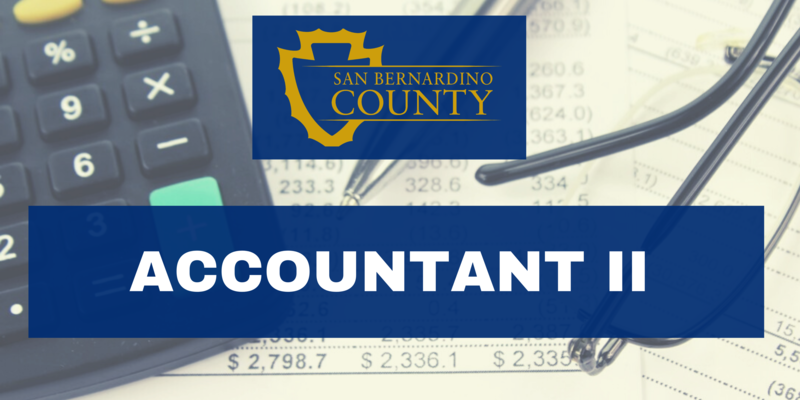 Option 2: An active California Certified Public Accountant (CPA) license may substitute for the education requirements. List your license number under the license/certification section of the application. Note: Qualifying degrees or coursework must be completed at a college or university accredited by any accrediting association recognized by the United States Department of Education. Degrees or coursework completed outside the U.S. must be accompanied with an evaluation report from a reputable credential evaluation service showing equivalency to degrees or coursework completed at a college or university accredited by any accrediting association recognized by the United States Department of Education.